When George Orwell wrote Nineteen Eighty-Four, he imagined Telescreens – devices that operated not only to play video, but also for surveillance complete with cameras and microphones. Now in 2019, Smart TVs are projected to be the fastest growing category of voice assistant technology by Hampshire, U.K.-based Juniper Research. Smart TVs will expand at a pace of more than 100 per cent compound annual growth rate for the next five years, Juniper predicts. Combine that with the growth of smart speakers at more than 40 per cent, as well as wearables at slightly more than 40 per cent, and 8 billion digital voice assistants will be in the market by 2023, up from an estimated 2.5 billion at the end of 2018. Whereas the fictional Telescreens’ main purpose was surveillance by a totalitarian government, Smart TVs are motivated by more capitalistic factors. Amazon’s Alexa is the leader in this space as the most common voice assistant featured on connected devices. That helps Amazon’s strategy of using voice as a purchasing channel, allowing its customers to order products without even looking at a screen. However, Juniper predicts that as voice commerce grows to about $80 billion per annum by 2023, it will be digital goods and money transfer services driving that revenue, not physical goods. Another market impact of the proliferation of smart assistants is a negative effect on the makers of apps specifically for smartphones and tablets. Juniper expects revenue from these apps to fall in key markets starting in 2022, as consumers tend towards experiences compatible with their voice assistants. How do people use voice assistants today? If Juniper’s predictions are to be realized, a change in consumer behaviour is necessary. 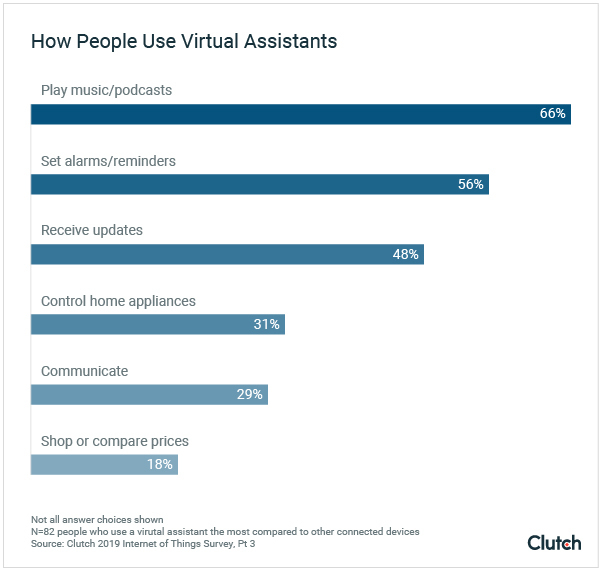 When it comes to how people are using voice assistants today, shopping is pretty far down the list, according to a survey of 503 voice assistant users by business information firm Clutch. Two-thirds of users say they play music or podcasts with their voice assistants, while 56 per cent set alarms or reminders; 48 per cent access updates on news, weather, or sports; 31 per cent control smart home appliances; 29 per cent to communicate, and 18 per cent to shop or compare prices.